Note: Both signature and date are inscribed at lower left: “DG Rossetti pro matre fecit Apr: 27. 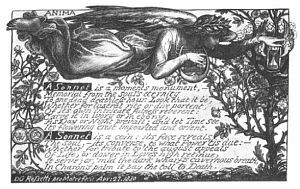 1880.” “ANIMA” is inscribed at upper left. This is the original illuminated text drawing that DGR made for his mother's birthday. 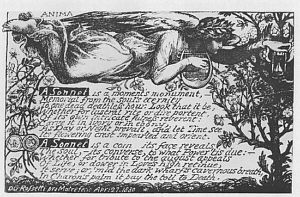 The drawing was laid into the front of a copy of David Main's Treasury of English Sonnets (1881), which had laid into the back a birthday poem by CR. Brother and sister then presented the book to their mother. DGR executed this illuminated work in March and April 1880. It was first published in 1882 as the frontispiece to William Sharp's DGR: A Record and a Study. Several interesting proof copies survive. 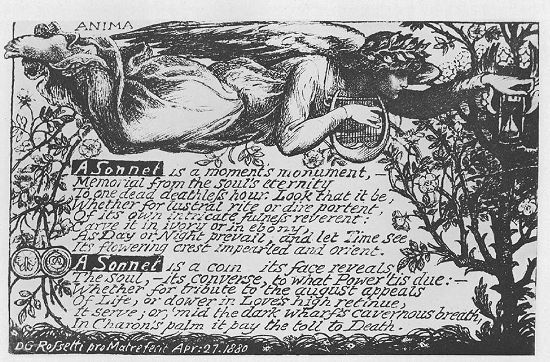 Benedetti, Dante Gabriel Rossetti, 338. Marillier, DGR: An Illustrated Memorial, 198, 200. WMR, Poems of DGR, with Illustrations. Surtees, A Catalogue Raisonné , vol. 1, 153 (no. 258). It's flowering crest impearled and orient. In Charon's palm it pay the toll to Death. Marillier, DGR: An Illustrated Memorial , 198.